The wetlands at the August A. Busch Memorial Memorial Conservation Area are home to a variety of wildlife. After a historically hot and dry winter here in Missouri, spring rains have hit the state in a big way. With more rain forecast for the coming week, concerns over the winter drought could soon be supplanted by concerns about flooding. One critical piece of Missouri’s environment that helps guard against rising waters is the state’s wetlands – flood plains and wet prairies that can absorb excesses from rivers. 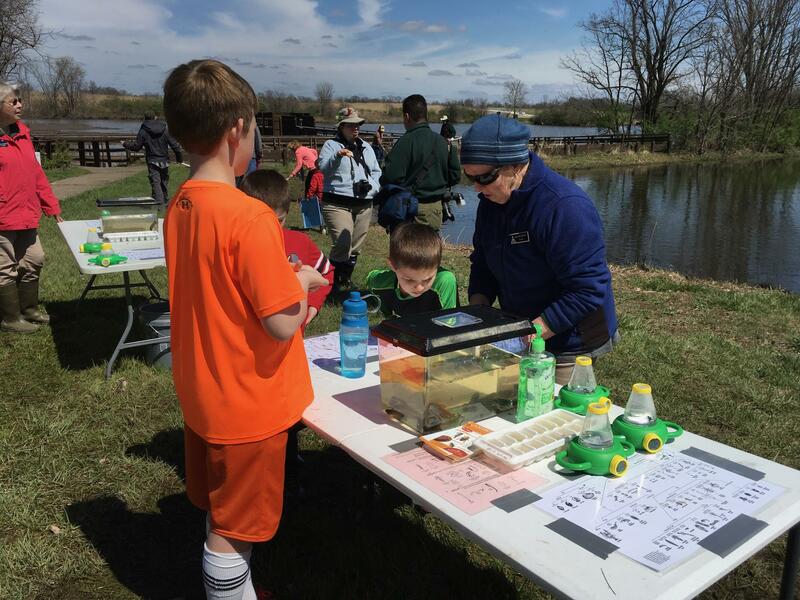 But wetlands are also critical habitat for a wide variety of wildlife, something scores of kids learned on a recent Saturday in Saint Charles. On a sunny spring afternoon at the August A. Busch Memorial Conservation Area, about a dozen children gathered around a pond, probing the waters with long-handled nets. After emptying their nets into shallow plastic trays, they walked over to a nearby table, where volunteer Melanie Sanford helped them identify their findings. This was the Missouri Department of Conservation’s annual Wetlands for Kids day. For almost 20 years the event, sponsored by Ducks Unlimited, has brought thousands of kids out to learn about wetlands. Sanford, a retired science teacher, ran the pond station with her husband Jim, a retired superintendent. "We try to get the kids hooked on nature. That’s the whole idea – we try to get them to appreciate the outdoors," Sanford said. Melanie Sanford teaches a group of children about wetland wildlife. The aquarium they set up was teeming with life – tadpoles, salamanders, water bugs – typical wetland fauna. "To help them to see the diversity of life that we have just in a small pond, and to help them to understand that the conservation of the wildlife that we have in our natural areas is an important part of our own life," Sanford explained. In a nearby lake, a family of geese was foraging for food. According to the department of conservation, more than one fourth of Missouri’s bird species depend on wetlands for food and habitat. 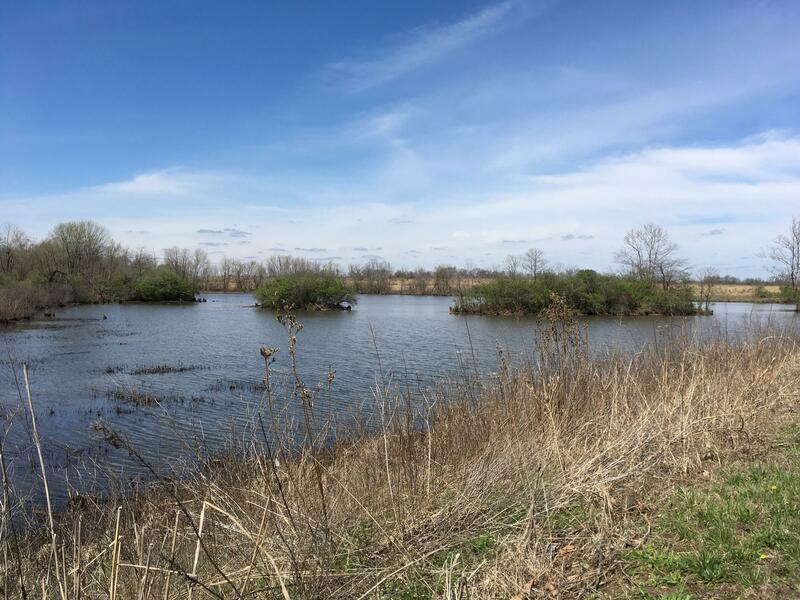 But with all the rains Missouri has seen over the last month, the event’s organizers, like MDC naturalist Matt Ormsby, are quick to note the functional importance of wetlands when it comes to flooding. "There are some places, we would call like marshes or wet prairies, they’re going to take a lot of that water and they’ll slowly let it filter off, compared to these impervious surfaces like yards and streets," Ormsby said. Where water runs off those surfaces and contributes to flooding lower-lying areas, wetlands absorb that water, and then release it more slowly into the ground. Now, wetlands are disappearing because of something called channelization. Ormsby explained, "It’s basically straightening out the river, it’s basically for barge traffic. A river over time meanders, it cuts banks on one side and it switches: it’s a moving thing." By channelizing the river, humans alter that dynamic in ways that can damage or destroy wetlands. "We’ve kind of stuck it in this straight pattern, and that’s the reason we have these flooding issues," Ormsby added. And that flooding might get worse. Climate change researchers project that rains in parts of the U.S. will get more intense as the planet warms. Last winter saw damaging flooding along the Meramac and Mississippi rivers, and the winter before that, 14 people died in floods across the state. Ormsby said that adds urgency to the department of conservation’s outreach efforts, beyond Wetlands for Kids. "We do have actually cost-share programs available to public landowners where they may want to create a wetland on their property. We have programs to help those landowners improve the wetlands on their property." But back at the pond all the excitement was about the creatures that live in the wetland, and forming connections with nature. The event’s organizers hope experiences like these will inspire the next generation of conservationists.